Over the past week, Michigan has had some notable visitors. First off, 2015 RB Jacques Patrick visited Ann Arbor on Monday. Patrick stayed the night Monday and had another full day in Ann Arbor on Tuesday. After his visit, Jacques will then be heading to Detroit for the Sound Mind Sound Body camp. With Michigan seemingly falling out of favour with 2015 RB Damien Harris, landing a quality running back this cycle is imperative. Although prying a prospect out of Florida is no easy task, Jacques does have a Michigan connection with his brother currently enrolling at Western Michigan. The coaching staff will surely use “only taking one RB in this class” tactic while recruiting Patrick. Jacques is currently being recruited by Coach Fred Jackson. While on his visit, Jacques was able to step foot in the Big House and tweeted this photo out to former Michigan legend Desmond Howard. 2015 RB Mike Weber also visited Ann Arbor over the weekend. This was Mike’s second visit of the week, with the first one coming last Wednesday. There was conflicting reports last week that Weber had announced a Top 3 that did not include the Maize and Blue. The coaching staff will look to get back into his Top 3 after two solid visits last week. Apparently, Mike showed up on Wednesday and had not heard about the Ty Isaac situation that unfolded last week. 2015 Offensive Tackle Grant Newsome visited campus on Friday, after a stop in Happy Valley on Thursday. With only one offensive lineman taken so far in 2015 (Jon Runyan Jr.), the coaching staff has made Grant a priority. While on campus, Grant got the academic/football facility tour and, then sat down with Coach Nussmeier and talked about the state of the program. After his visit with the coaching staff, Grant was able to hang out with current Wolverine A.J Williams and got to meet some of the other current/former players including 2014 draftee Taylor Lewan. Academics seem to be playing a big part in Newsome’s recruitment, and where else could be better than Michigan? Newsome will likely choose between Michigan and Penn State in the next few days. 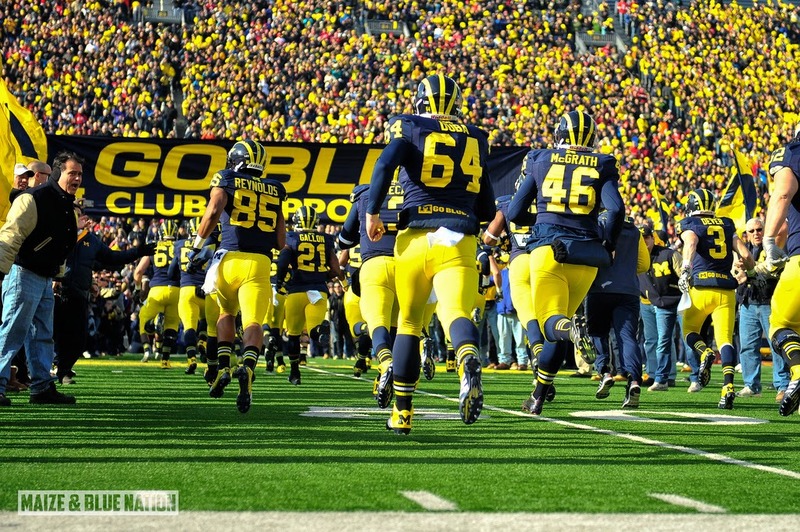 EDIT: Grant Newsome committed to Michigan on Wednesday morning. June is always a very hectic month in recruiting. The coaching staff will be holding a “camp” next week , and the following prospects are scheduled to show: QB Jacob Harrison, DE Kyree Campbell, OT Liam Eichenberg, WR Cory Contini, CB Devin Taylor, DE Khalid Kareem, DE Jonathon Cooper, WR Austin Mack and, LB David Reese. Other visitors expected to make an appearance on campus next week include; TE Chris Clark, QB Shea Patterson, DE Jashon Cornell and, QB K.J Costello. 2015 WR Auden Tate released his top 10 via twitter on Friday. No surprise Michigan makes his list. Auden has been recruited very hard by the coaching staff lately. Auden was on campus two weeks ago, and the visit went very well according to reports. Could Auden be the next commit? 2016 Steven Smothers will be visiting Michigan in July. The speedy receiver is currently being recruited by Curt Mallory. 2016 WR Justin Layne also visited campus this week. Justin got the full Michigan football tour in the morning and, then met with basketball coach John Beilein. Justin is currently ranked as the # WR in the 2016 recruiting cycle according to Rivals. While on his visit, Justin spoke with Steve Lorenz and released his Top 3 schools at the moment. Justin is currently being recruited by Jeff Hecklinski. "I'd say my top three schools are Michigan, Michigan State and Ohio State," Layne noted. "I really have liked those three visits the most and like what they have to offer me. There hasn't really been a big difference at this point for me between those schools, and I have more visits I want to take. That's just who I would have as my top three right now." Good to see the coaching staff making headway early with one of the top ranked receivers in next year’s class. 2015 ATH Javarius Davis will be visiting Michigan today. Javarius visited Ohio State on Tuesday and, will take in Alabama, Auburn and, Florida later this week.